How do we equip our cities for the future? If we want cities that are both CO2 neutral and future proof, we need a new interpretation of the interplay between digitalization, the energy transition, sustainable development and urban processes. 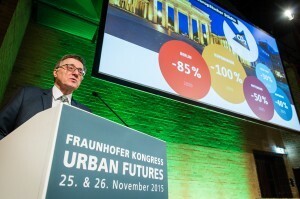 Fraunhofer’s “Urban Futures” Conference aims to bring together relevant stakeholders from Germany and abroad specialising in sustainable urban development and the smart cities. Visionaries from municipalities, politics, business and research will be presenting and discussing their solutions for the cities of the future. We are expecting more than 400 experts to attend. Exceptional program formats such as the “Call for ideas” innovation competition, “Morgenstadt marketplace”, “Speed dating” for mayors and the „Ideas lounge” offer additional opportunities to gather information and exchange ideas. Find out more about the conference program, confirmed speakers as well as signing up details by visiting our website. This discussion and networking event will take place on Thursday 8th October from 17.30 – 20.00 in Siemens’ R&D Centre, The Crystal, London E16 1GB. The challenges around the creation of smart city districts are not technology based. 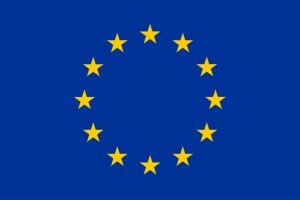 Their establishment and the solutions and technologies within them rely increasingly on collaborative working between public authorities, private sector industrial partners and academic institutions – this creates some unique challenges around governance and leadership as well as ownership of assets and data. Smart city districts need to be able to demonstrate ‘place’ based benefits as much as ‘organisational’ ones. How we replicate smart city districts on a commercial basis and at scale also creates its own set of issues within a challenging public sector finance arena. This event will explore the challenges and opportunities faced by Manchester’s Triangulum project, which focuses on the integration of energy, mobility and ICT systems around infrastructure assets within ‘Corridor Manchester’, and is a collaborative project involving five strategic partners: Manchester City Council, University of Manchester, Manchester Metropolitan University, Siemens, and Clicks and Links. Please RSVP to appg.smartcities@bellenden.co.uk or call 0207 403 1734 if you would like to attend. StrijpS, district in smart city project TRIANGULUM, every 3rd sunday of the month. ‘Feel good market’ for smart people that eat smart food. The Triangulum project was presented at the Nordic Edge Expo in Stavanger, Norway. The expo, which gathers creators of smarter cities and smarter homes, aims at becoming Northern Europe’s most important arena for knowledge exchange and inspiration. Smart cities, change-making companies, forward-thinking universities and dynamic organizations are attending the event. Triangulum’s representatives Alanus von Radecki (Fraunhofer, Germany), Steve Turner (Manchester City Council, UK), Henk Kok (City of Eindhoven, Netherlands) and Tone Grindland (City of Stavanger, Norway) are part of the world-class collection of speakers taking part on the Nordic Edge Expo. 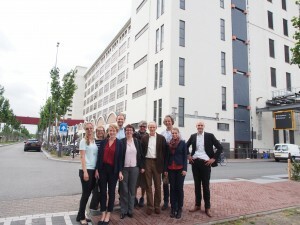 The TRIANGULUM Steering Committee met in Eindhoven on 22nd – 24th June 2015 to discuss the progress of the project and to visit the Lighthouse District Strijp-S, a central development area situated in the former innovation hub of Philips. The project aims at transforming the former area into an innovation district providing the right eco-environment for the development of smart services and start-ups. 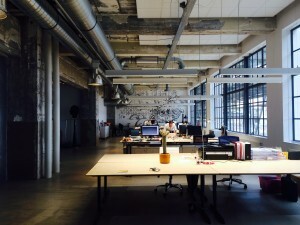 In order to do that, a variety of different concepts and co-working facilities, exhibition areas, innovation laboratories and business incubators will offer their services and working space to the young companies of tomorrow. From the left: Belma Covic (Stavanger), Michelle Oddy (Manchester), Nora Fanderl (Fraunhofer), Damian Wagner (Fraunhofer), Alexandra Fezer (Steinbeis-Europa-Zentrum), Gerd Seehuus (Stavanger), Henk Kok (Eindhoven), Hans van Amelsvoort (Eindhoven), Saskia Heyde (Steinbeis-Europa-Zentrum), Thijs van Dieren (Volker Wessels).